FlossieBlossoms: Owls? Are you KIDDING me??? Yer killin' me, Mom. Seereusly. Ok that looks done... let's see those photos of flickr. At least if I can't get anything done, I can live vicariously thru you! Stumbled over here a while ago and love to check back to see your beautiful creations. Do you ever do custom quilts? LMBO, you are cracking me up! 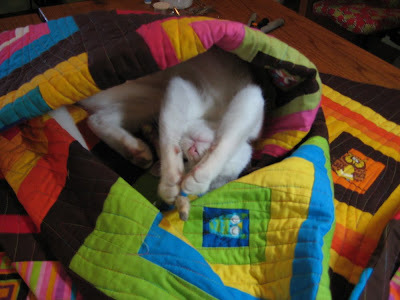 Don't they just love finding the quilts to curl up on. Oh my goodness!! What a wonderful way to start my day. 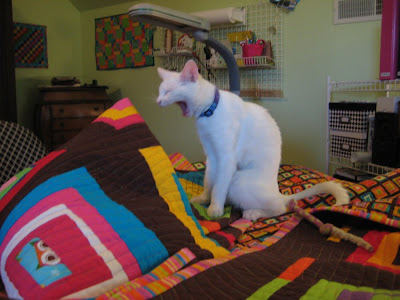 NP is so funny, and of course your newest quilt is darling. I've been following on flickr as this quilt as come together. Amazing as usual! Great job girl! Squeeee!!! Kitty-cat!! Man, she's getting big. And I spy my favourite wee keeking over hoolit on that first pic!